Above: Pure Water Products 4-stage Q Series unit, Q364, with a 36 gallon-per-day thinfilm (TFC) membrane. We feel that there are at least 97 good reasons why you should get one of our Q36 Series RO units. Most of them have to do with simplicity. 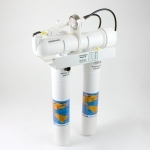 We designed this unit to be the most dependable and trouble-free RO (reverse osmosis) unit possible, as well as the easiest to install, the easiest to service, and the easiest to fix if it ever needs repair. It's a unique product, but it's built of readily available, standard-sized parts that are produced by the most trusted names in the industry. 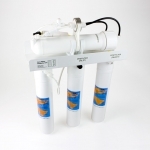 The filter cartridges are from the Omnipure Q Series line of tough, effective commercial-grade filters. 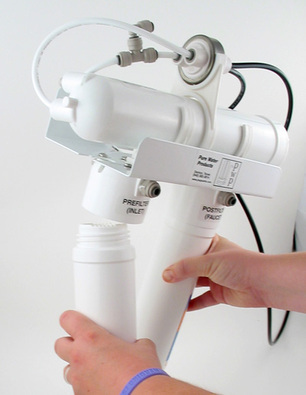 The Omnipure disposable filter units have long been favorites in restaurants, the vending industry, and laboratories because of their unchallenged effectiveness, durability, leak-free service, and ease of installation and replacement. It uses the ultra-reliable Payne control system that shuts the unit off when the storage tank is full, and a Pentek membrane housing with a high-quality Filmtec membrane. It's built on a strong steel frame. It is made with ultra-strong John Guest tubing joined together with quick connect fittings for leak-free performance and ease of installation. Q Series units all come with everything you need for installation. You get a choice of our Tomlinson Pro-Flo or Contemporary “Value” ledge faucets (addtional styles and finishes are available on our faucet page.) The inlet system is either our best saddle valve for installation on copper pipe, or our EZ Adapter for installation with flexible cold water pipes. A high quality drain saddle with quick connect fitting, our favorite metal storage tank, and extra tubing are included. Note about ordering: You'll need to tell us if your cold water faucet under your sink gets its water from a copper pipe or a flexible tube (often these are braided steel tubes) when you order. If you have clean (dirt-, sand-, rust-, silt-free) water, the three stage unit Q363 is your best choice. 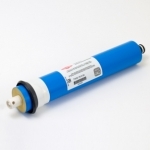 However, if there is visible sediment in your water, it's best to protect the carbon pre- filter with a sediment filter, and the Q 364 unit should be ordered. If you have questions about which unit you need, don't hesitate to call us at the number above. On new Q Series units, the standard carbon pre-filter is a top quality 10-micron carbon block. The carbon post-filter is a granular coconut shell carbon. If desired, this setup can be altered to fit your specific needs when you replace the cartridges. See "Cartridge Logic" for details. 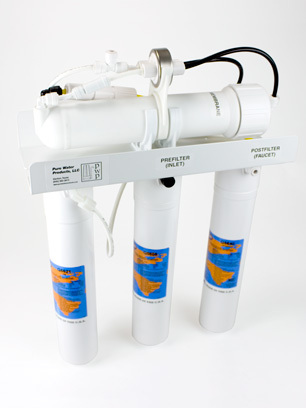 Includes carbon block prefilter, membrane, and coconut shell carbon post filter. Plus storage tank, faucet, inlet valve, drain saddle, and extra tubing. Everything you need. 5 micron sediment prefilter, carbon block prefilter, membrane, and coconut shell carbon post filter. Plus storage tank, faucet, inlet valve, drain saddle, and extra tubing. Everything you need. 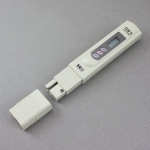 If you're purchasing a Q Series RO unit, it will come with cartridges. We'll send you a reminder notice a year from the month of purchase. If you want to purchase extra cartridges now, we suggest you look at the "Q Series Cartridge Logic" for options that could save you money and enhance the performance of your unit.